The Lough Legacy Veterans Parade - Honoring Those Past and Present | Clark County Live! For 32 years The Lough Legacy Veterans Parade has been a tradition in Vancouver honoring all branches of the military and the service of those both past and present. Come out and support your veterans on Saturday, November 10th from 11:00 AM to 1:00 PM. 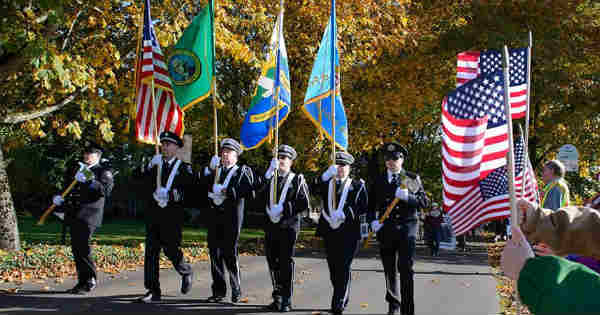 The parade will start at the east end of Officers Row at East Reserve Street and will head west along Evergreen Blvd, past Officers Row and Providence Academy into downtown Vancouver. Every year 2,500 people with 120 groups march in honor of our communities veterans. These groups include 45 scout troops, 200 vehicles, and more than 60 animals. If your group or organization is interested in supporting our nation’s veterans, visit The Historic Trust online to register. Prior to the parade, the Veterans Day Ceremony in the Providence Academy Ballroom will recognize local veterans. The 2018 Grand Marshal will also be honored for their service. For those who attend the Ceremony, there will be limited covered seating to view the parade on the Academy lawn. For more information, visit The Lough Legacy Veterans Parade Facebook event.